OHMI’s 2018 Conference and Awards, a major conference exploring the barriers to music-making faced by people with physical disabilities, took place this past 7th and 8th of September at Royal Birmingham Conservatoire. Amongst the delegates was Emma Nenadic, PHD Researcher and post-doctoral student working with Music Mark’s trustee Dr. Martin Fautley of Birmingham City University. Bridget Whyte, Chief Executive of Music Mark and a guest speaker at the event asked Emma if she could offer Music Mark members and its wider audience a write-up of the event. Emma kindly sent over this piece. Enjoy! The inaugural OHMI (One Handed Musical Instrument) Trust Conference & Awards 2018 took place on 7th – 8th September at Royal Birmingham Conservatoire in the heart of Birmingham city centre, nearby where the trust is based. The two-day conference Music & Physical Disability: From Instrument to Performance brought together a diverse, international group of disabled musicians, teachers, researchers and practitioners to explore barriers to music-making faced by those with physical disabilities. 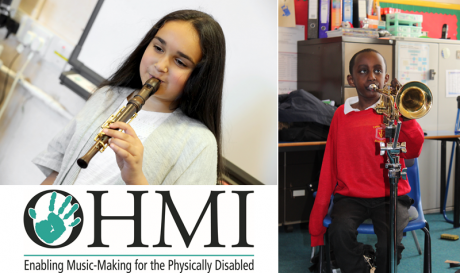 This was an important and timely event for OHMI Trust who note that ‘full and undifferentiated participation in music for people with physical disabilities is a subject only recently receiving attention’. The gala concert and awards included a wonderful performance of Mozart’s Horn Concerto No.4 by French horn player, Felix Klieser, aka ‘the man who plays French horn with his toes.’ The concert was compered by comedian Al Murray who has shared his struggle getting help for his daughter’s disability and finds it “heartening” to know that charities such as OHMI are working to make things better. Collaboration was a common theme across the conference. Asked why collaborations in accessible instrument building were so important, musician-practitioner John Kelly, asked about his work with Drake Music, felt they enabled space for “forging something that is equal”. Chief Executive of Music Mark, Bridget Whyte, shared how partnership working is “key for the future” of inclusive music education affording stakeholders “room to think”. Head of the Wolverhampton Music Service, Ciaran O’Donnell, reflected how working with others led to a growth in access, quality and ethos. One such collaboration featured at the conference is between the Sonic Arts Research Centre at Queen’s University Belfast and Drake Music Northern Ireland who are using digital musical instruments to explore ‘innovative modes of inclusive musical interactions for disabled musicians.’ Dr Alex Bell discussed how the Monthly Music Hackathon in New York City brings people together with a passion for hacking old and new instruments. PhD researcher Alex Lucas is addressing issues of sustainability through ‘inclusive making of assisted technologies’ which aims to reduce expertise and blur the roles and responsibilities of facilitators, designers and participants. Research into OHMI’s teaching pilot, conducted by Birmingham City University and led by Professor Martin Fautley and Dr Victoria Kinsella, highlighted the importance of collaborative learning between teachers and learners. Progress was seen where one-to-one instrumental lessons allowed children ‘to break down the process’ with ‘a teacher that did not prescribe approaches but explored with the young people the most effective ways to develop practice.’ The research report can be accessed here. Prescriptive approaches were further dispelled by community musician Sarah Fisher who got the whole auditorium moving with a body percussion activity, demonstrating that when it comes to making music there is no rulebook and passionately championing her belief in ‘a way not The way’. We would like to say a huge thank you to the OHMI Trust staff and trustees for their fantastic work in enabling people to share their knowledge and experiences, and for their ongoing efforts in raising awareness of music and disability. To echo OHMI trustee Dr Stephen Hetherington’s closing words, “the possibilities are endless for what we’re all trying to achieve.